The temperature in urban areas can be several degrees higher than their surrounding due to the Urban Heat Island (UHI). The additional heat stress is an important medical problem and studied by bio-meteorologists. Many urban geographers study the UHI and ways to reduce the heat stress. Their work suggests that the UHI is due to a reduction in evaporation from bare soil and vegetation in city centers. The solar energy that is not used for evaporation goes into warming of the air. In case of high-rise buildings there are, in addition, more surfaces and thus more storage of heat in the buildings during the day, which is released during the night. High-rise buildings also reduce radiative cooling (infrared) at night because the surface sees a smaller part of the cold sky. Recent work suggests that cities also influence convection (often visible as cumulus (towering) clouds). To study changes in the temperature, a constant UHI bias is no problem. The problem is an increase in urbanization. For some city stations this can be clearly seen in a comparison with nearby rural stations. A clear example is the temperature at the station in Tokyo, where the temperature since 1920 rises faster than in surrounding stations. Scientists like to make a strong case, thus before they confidently state that the global temperature is increasing, they have naturally studied the influence of urbanization in detail. An early example is Joseph Kincer of the US Weather Bureau (HT @GuyCallendar) who studied the influence of growing cities in 1933. 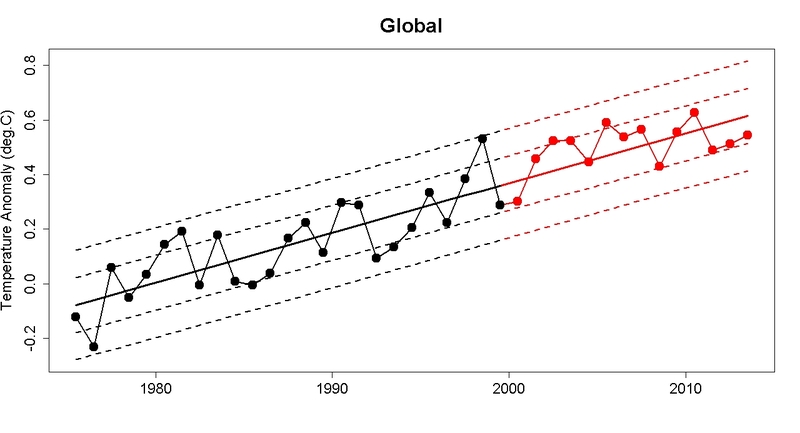 While urbanization can be clearly seen for some stations, the effect on the global mean temperature is small. The Fourth Assessment Report from the IPCC, states the following. 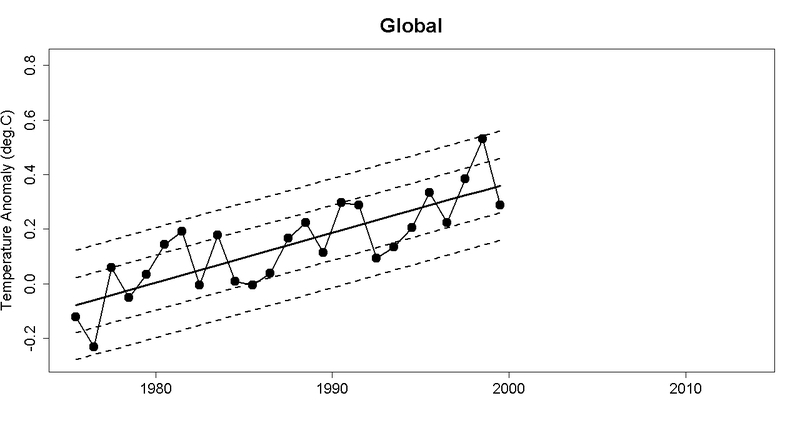 Studies that have looked at hemispheric and global scales conclude that any urban-related trend is an order of magnitude smaller than decadal and longer time-scale trends evident in the series (e.g., Jones et al., 1990; Peterson et al., 1999). This result could partly be attributed to the omission from the gridded data set of a small number of sites (<1%) with clear urban-related warming trends. ... Accordingly, this assessment adds the same level of urban warming uncertainty as in the TAR: 0.006°C per decade since 1900 for land, and 0.002°C per decade since 1900 for blended land with ocean, as ocean UHI is zero. Next to the removal of urban stations, the influence of urbanization is reduced by statistical removal of non-climatic changes (homogenization). The most overlooked aspect may, however, be that urban stations do not often stay at the same location, but rather are relocated when the surrounding is seen to be no longer suited or the meteorological offices simply cannot pay the rent any more or the offices are relocated to airports to help with air traffic safety. Thus urbanization does not only lead to an gradual increase in temperature, but also to downward jumps. Such a non-climatic change often looks like an (irregular) sawtooth. This can lead to artificial trends in both directions; see sketch below. In the end, what counts is how strong the UHI was in the beginning and how strong it is now. The first post of this series was about a new study that showed that even villages have a small "urban heat island". For a village in Sweden (Haparanda) and Germany (Geisenheim) the study found that the current location of the weather station is about 0.5°C (1°F) colder than the village center. For cities you would expect a larger effect. Around the Second World War many city stations were moved to airports, which largely takes the stations out of the urban heat island. Comparing the temperature trend of stations that are currently at airports with the non-airport stations, a number of people have found that this effect is about 0.1°C for the airport stations, which would suggest that it is not important for the entire dataset. This 0.1°C sounds rather small to me. If we have urban heat islands of multiple degrees and people worry about small increases in the urban heat island effect, then taking a station (mostly) out of the heat island should lead to a strong cooling. Furthermore, cities are often in valleys and coasts and the later build airports thus often are at a higher and thus cooler location. A preliminary study by citizen scientist Caerbannog suggests that airport relocations can explain a considerable part of the adjustments. These calculations need to be performed more carefully and we need to understand why the apparently small difference for airport stations translates to a considerable effect for the global mean. A more detailed scientific study on relocations to airports is unfortunately still missing. Also the period where the bias increases in GHCNv3 corresponds to the period around the second world war where many stations were relocated to airports, see figure below. Finally, also that the temperature trend bias in the raw GHCNv3 data is larger than the bias in the Berkeley Earth dataset suggests that airport relocations could be important. Airport stations are overrepresented in GHCNv3, which contains a quite large fraction of airport stations. With some colleagues we have started the Parallel Observations Science Team (POST) in the International Surface Temperature Initiative. There are some people interested in using parallel measurements (simultaneous measurements at cities and airports) to study the influence of these relocations. There seems to be more data than one may think. We are, however, still looking for a leading author (hint). If the non-climatic change due to airport relocations is different (likely larger) than the change implemented in GHCNv3, that would give us an estimate of how well homogenization methods can reduce trend biases. Williams, Menne, and Thorne (2012) showed that homogenization can reduce trend errors, that they improve trend estimates, but also that part of the bias remains. In the 19th century and earlier, thermometers were expensive scientific instruments and meteorological observations were made by educated people, apothecaries, teachers, clergymen, and so on. These people lived in the city. Many stations have subsequently been moved to better and colder locations. Whether urbanization produces a cold or a warm bias is thus an empirical and historical question. The evidence seems to show that on average the effect is small. It would be valuable when the effect of urbanization and relocations would be studies together. That may lead to an understanding of this paradox. "How can the pause be both ‘false’ and caused by something?" She really did, if you do not believe me, here is the link to her blog post. I have trouble seeing a contradiction, but I have seen this meme more often among the mitigation sceptics. Questions like, how can you claim there is no hiatus when so many scientists are studying it? Let's first formulate it abstractly, then give a neutral example, before we go to the climate change case where some people suddenly become too creative. "How can the pause be false" can be translated to: how can you claim A is still related to t? While "caused by something" can be translated to: A is also related to X, Y, and Z.
I hope the abstract case makes clear that you can claim that A is related to X, Y and Z without claiming that A is not related to t.
The neutral, I hope, analogues argumentation would be: How can the claim that economic growth needs free markets, property rights and rule of law be true, at a time that economists are studying the influence of the [[Lehman Brothers]] crash on economic growth? I know, analogies do not work in the climate "debate". Someone will always claim that they do not fit. Which is always right. That is why they are called analogies. There is no statistically significant change in the trend. People who think they see that in a the temperature signal are often just shown a small part of the data and they overestimate the significance of short-term trends. The uncertainty in a 10-year trend is not 10 times as large as the uncertainty of a 100-year trend. A 10-year trend is 100 times more uncertain. That there is no change in the temperature trend is visually clearly seen by these two elegant graphs made by Tamino. What causes these deviations from the trend line or the deviations from the average model projections is naturally an interesting question. Something that climatologists used to simply call: natural variability, small stuff, impossible to understand in detail. It is a great feat that climatologists now dare to say something about these minor deviations. 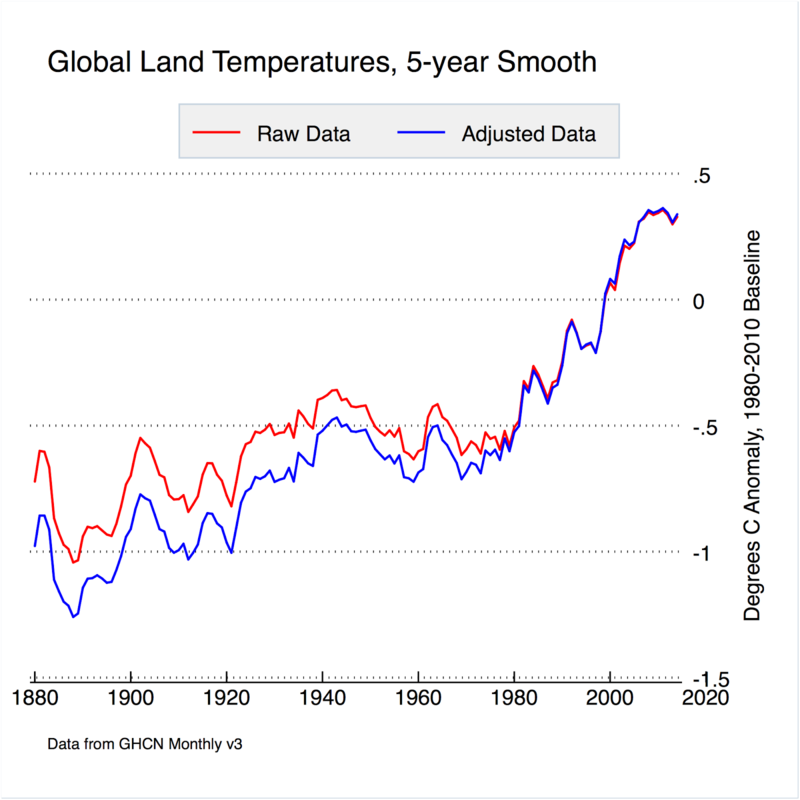 Remember that we had more than half a degree of warming over many decades before climatologists said with any kind of confidence that global warming is real. Even if these dare devils turn out to be wrong, it tells a lot about the quality of our modern climate monitoring capabilities, climate models and analysis tools, that scientists are willing to stick their neck out and say: I think I know what might have caused these minimal deviations of a tenth, maybe two tenth of a degree Celsius. Pretty amazing.